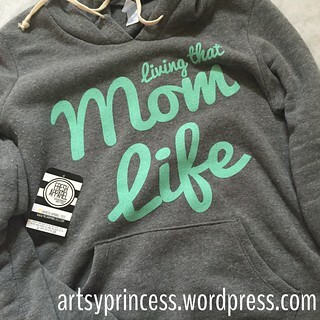 Shopping small – Fresh Apparel | Living life in the carpool lane.. Supporting the small shop community has kind of been my thing lately. I respect the hard work of every ‘momtrepreneur’ out there. It’s tough working from home, juggling the kids, and trying to keep a business running. I should know. I promised myself I would try to shop small and from the handmade community as much as I can and that I will try my best to promote them in my small corner of the Internet. So, here we go! This sweater is from Fresh Apparel. They specialize in various sweaters, T-shirts, and tank tops for children and adults. This has got to be one of my favorite designs they have. 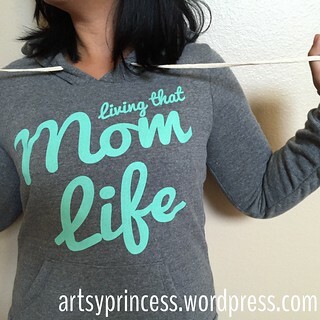 I’m definitely ‘living that mom life’ and love wearing this sweater during these cool spring mornings. It’s soft and super comfy. However, I do know that this sweater is a seasonal item for the shop. I believe that by the time this blog post publishes, this sweater is no longer available until next fall. I’m still featuring it on the blog because I would love for you to visit their website and check out all the other awesome items and designs they offer! Visit them on Facebook at Fresh Apparel for my information about the shop and their products. Don’t forget to visit their shop directly at Fresh Apparel.